Beta Bee highlights one of nature’s most powerful designs. Commissioned by the City of Greater Geelong for the “Geelong After Dark Festival,” this bespoke art installation used the power of LED light and polypropylene coloured sheets to attract ‘bees to the hive’. Located on a walking path, the piece was an invitation to interact with an ever- changing multicolour wall of a rhythmic hexagonal nature. The dynamic structure of Beta Bee celebrated a careful design that allowed visitors to comfortably be part of the artwork by taking pictures and videos, and encouraging engagement and interaction – one of the festival’s main objectives. 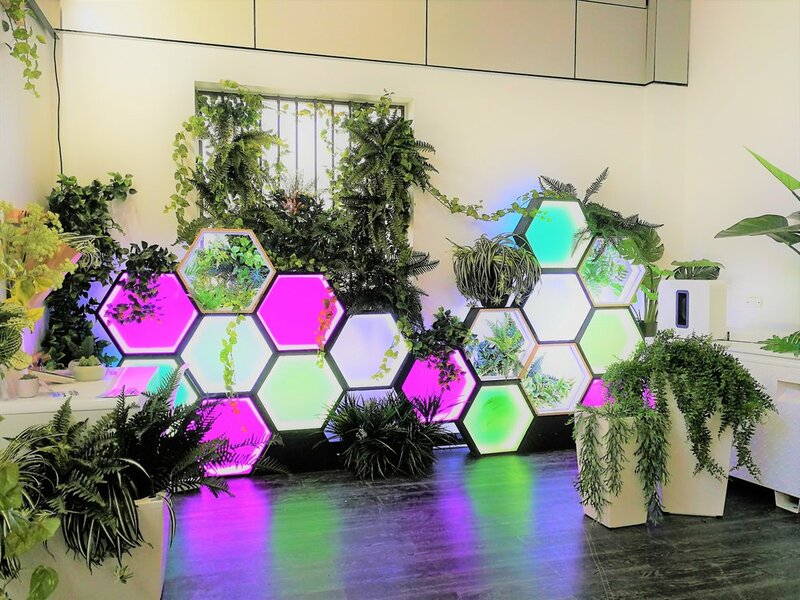 “Garden Beet,” one of Australia's premium vertical garden designers and suppliers selected a bespoke version of the artwork Beta Bee to showcase their wide range of plants. The colours of the company’s brand and the show room’s architectural display served as basic elements to repurpose this installation. The store’s high ceilings offer plenty of natural light, inspiring a well-balanced composition of the artwork and the vivacious wild garden surrounding it. Rethorical Figures was a site specific for the exhibition space located at the main entrance and reception area of the recently inaugurated “Bargoonga Nganjin Library”. The building, work of the “City of Yarra” for the local community of North Fitzroy, celebrates the Aboriginal people of Australia,” hence its name: “Bargoonga Nganjin,” (‘Gather Everybody,’) in Woiwurrung, the language of the Wurundjri. It was important to create a welcoming piece that attracted visitors and honoured the original owners of the land. So by taking the fascinating pattern designs of serpents and snakes found in aboriginal paintings as inspiration, Rethorical Figures came to life, combining a curved-serpentine design with a paper-folded composition that unifies the art of original owners of the land, with the original material of books in a library: paper. Kami – Paper Shop is a boutique shop in the vibrant neighbourhood of Fitzroy in Melbourne and they commissioned a window display to refresh their look and attract new clients. The piece encompasses two tridimensional pictures using paper as the main medium. With paper sourced from the shop, the development involved a bespoke template to create a modular composition in which the piece allowed a design of different patterns and shapes along the surface, stimulating the use of paper as main material for artwork and celebrating its properties and versatility as a material in its own right. “Urban Smart Projects“ provides an urban art gallery by engaging creativity and delivering public artworks on street cabinets. Urban Geometry commissioned by the City of Werribee, Victoria, brings a colourful and dynamic geometric design to the town’s landscape. Solo show held at the “Yarra Sculpture Gallery” in Fitzroy, a suburb in the heart of Melbourne’s artistic epicentre. Santiago to Melbourne showcased a broad variety of artworks, from volumetric framed compositions, to sculptures and installations. The pieces celebrate carefully designed artworks manufactured with different materials and techniques that display a wide variety of mediums and approaches to sculptural compositions, exploring the viewer’s visual and physical perception. The use of defined lines and forms to create colourful geometric compositions attracted a young and adult audience fostering their engagement with the piece. This exhibition, showed 14 pieces from 2014 to 2018, depicting 4 years of ongoing development and the transition between Art Gallery works to Public Art-Design piece. Sculpture by the Sea, Cottesloe. Sculpture by the Sea has become a large art event staged at Cottesloe beach, in Western Australia. It is an outdoor sculpture exhibition, in which sculptures and installations are displayed from the sea wall to North Cottesloe during a period of two weeks. The pieces scattered in the sand and surrounded by green areas result in a beautiful sculpture park. Emergence, a site-specific installation designed for the 14th version of the event, highlights the importance of acknowledging and honouring our surrounding environment. The concept was inspired by the amplification of single sand grains, whilst highlighting their rising volumes blending in with the landscape. The grains invite visitors to use the sculptures as large pieces of outdoor furniture whilst celebrating an ergonomic design. Paper folded site-specific commissioned by the Winter Art’s Festival, produced by the City of Perth. The piece was earmarked for the Arts Bar in an underground tunnel. This location allowed us to illuminate this large white origami composition with black light streams, generating different hues of purple. The “Ringkøbing Wood Sculpture Symposium,” an event in which selected artists from different countries gather for a period of 5 days to create sculptures from the ground up, has become a tradition in the nostalgic town of Ringkøbing, in Western Jutland, Denmark. In this its 8th version, Mila’s abstract sculpture made of three fused geometric cubes was selected. This piece celebrates one of Denmark’s main sources of renewal energy by highlighting the wind’s power of transformation. By studying the integration of one shape into the other, this artwork explores the strength of the wind by modelling soft and smooth curves on the surface of the oak tree. These merging figures highlight the constant state of dependence of humans on nature. Institution: International Woodsculpture Symposium Ringkøbing. Every project starts with a very basic mock-up (my way of sketching) and then goes to Rhino or Illustrator. Artist-in-Residence at Gæsteatelier Hollufgård, Denmark. This new serie of works that highlights new discoveries in the field of astronomy during the las 10 years. After the artist’s visit to ALMA observatory - located in the Atacama desert, she has been developing collographies around the concepts of dark matter, the geometry of the universe and curve space. This is an ongoing investigation, part of a larger project along with other artists. West End Art Space - Melbourne, Australia. West End Art Space. Melbourne, Australia. Astronomic Landscape - Art Residence at GAH, Denmark. © 2018 Mila Poblete All rights reserved.